October 1986 marked a very important time in Mayo Clinic's history. This was the year that Mayo Clinic opened its first campus outside of Rochester, Minn. The new campus, located in Jacksonville, Florida, opened its doors to patients on October 13, 1986. As the 25th anniversary of the Florida campus drew closer, patients, staff and volunteers had many stories to share. In order to hear all these voices, a staged video booth was created for participants to record a favorite moment, memory or story of Mayo Clinic in Florida. Members of the Department of Public Affairs took their video camera to capture moments in time that will never be forgotten. 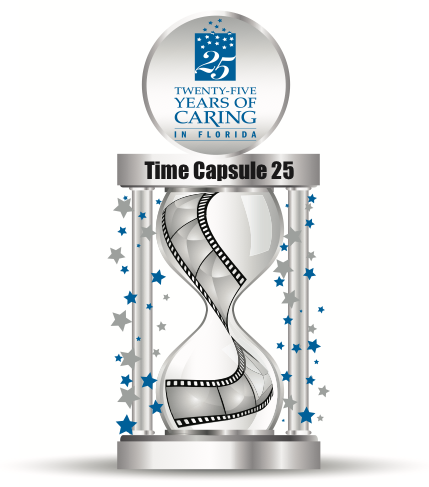 The project, "Time Capsule 25," represents voices of Florida's staff, volunteers and patients. Watch their stories as Mayo Clinic celebrates 25 years of caring in Florida. Twenty-five years of caring at Mayo Clinic in Florida takes on so many different - and powerful - meanings when you just take a few seconds to listen to the people who receive or provide that care. We discovered that special things happen every day at Mayo Clinic in Florida, even when miracles don't occur. And a special word of thanks to everyone who participated in "Time Capsule 25."